Among the various auto dealerships that you can start, one of the most popular options is selling used vehicles. In most states, launching your used car sales business entails undergoing a licensing process. The requirements that you have to meet vary from state to state. However, there are also repeating criteria, and posting a used car dealer bond is among the most common ones. To provide you with in-depth information on launching your business, we have created the ebook How to Become an Auto Dealer. It’s a completely free resource that extensively explains the process of starting an auto dealership in the U.S in a step-by-step manner. For specific information about obtaining a used car dealer license, below you can find additional details per state. As most other types of auto dealers, used vehicle dealers have to first choose a business structure. You then have to register a business entity with the appropriate state authorities. The next step is to obtain an Employer Identification Number (EIN) from the IRS, and in some cases, you may also need a state tax ID. Depending on state and local rules, you will need to meet various zoning requirements for your business location. You also have to provide a proof that you own or lease the place, which has to be included together with your license application form. In most states, you will need a general liability insurance policy in order to get licensed. Typically, it would cover bodily injury, accident and property damage. Posting a surety bond is one of the common requirements that used car dealers have to satisfy, similarly to other types of dealers. The bond serves as an extra layer of protection for the state and for your customers, guaranteeing your legal compliance. The bond amount that you have to provide varies from state to state, but is often between $10,000 and $50,000. On the basis of this amount, you have to cover a small percentage to get bonded. It is often between 1% and 3% for applicants with stable finances. When you’ve obtained your business entity registration, location documents, insurance, and auto dealer bond, you can move on to comply with the rest of the licensing requirements and submit your complete application form. Make sure that you have met the state criteria regarding your professional training and testing. You will need to pass a criminal background check, pay applicable licensing fees, and in some cases, undergo an inspection of your business location by state authorities. If you have successfully met all requirements, you will be issued your used auto dealer license. 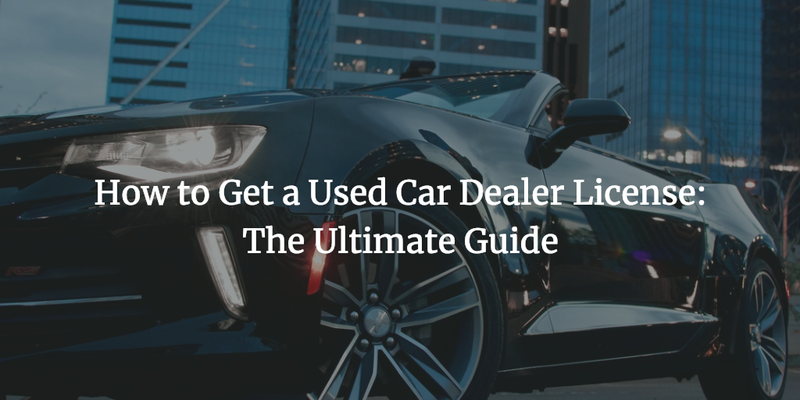 In about half of the states, in order to become a used car dealer, you have to meet a specific set of licensing requirements. It is different from what new (also referred to as franchise) dealers have to comply with. For the other half of the states, the licensing requirements for new and used vehicle dealers converge. In some states, there is no differentiation between dealers of the two types of vehicles. In others, a used car dealer license exists, but it is possible to sell used vehicles when having a franchised license too. The states are listed below, with explanation what type of license you should obtain. Do you need more information about getting your used car dealer license and bonding? Our bonding experts are here to assist you. Just call us at 877.514.5146.